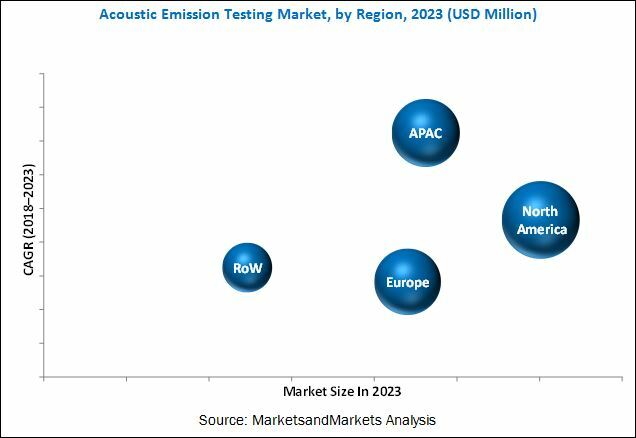 [134 Pages Report] The acoustic emission testing market is expected to be valued at USD 349.9 million by 2023, from USD 226.6 million in 2017, at a CAGR of 7.32% between 2018 and 2023. The base year considered for the study is 2017, and the forecast period is between 2018 and 2023. In 2017, the acoustic emission testing market was dominated by TUV Rheinland (Germany), MISTRAS (US), TUV Nord (Germany), Parker Hannifin (US), TUV Austria (Austria), General Electric (GE, US), Acoustic Emission Consulting (AEC, US), Vallen Systeme (Germany), KRN Services (US), and Score Atlanta (US). 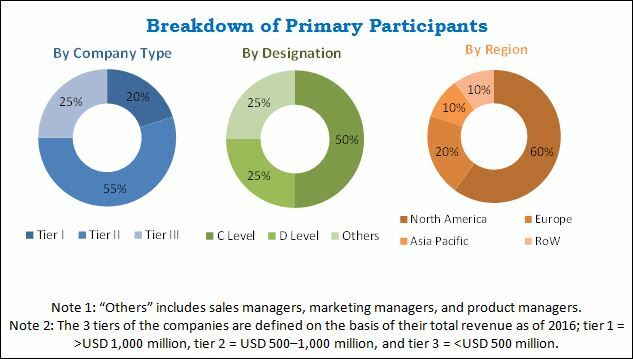 The acoustic emission testing (AET) market is expected to be valued at USD 349.9 Million by 2023, from USD 245.8 Million in 2018, at a CAGR of 7.32% between 2018 and 2023. Increasing need for asset health monitoring, government initiatives for the implementation of NDT solutions, and growing safety concerns to enhance productivity are driving the growth of this market. AET is used to assess asset integrity, performance, and productivity by identifying the various possible damages. This report segments the acoustic emission testing market on the basis of equipment, services, applications, and regions. Sensors held the largest share of the acoustic emission testing market in 2017. Sensors are an important part of acoustic emission measurement chain as they provide information related to physical aspects, which is necessary to monitor the behavior of structures or equipment. The market for inspection services is expected to grow at a higher CAGR during the forecast period. The defect detection process can be carried out during manufacturing using acoustic emission testing inspection services, instead of wasting time and money on further processing of faulty materials; it also helps in maintaining the uniform standard and quality of a product. Inspection services are useful for fixing up the defective components at the initial stage. Storage tank held the largest share of the acoustic emission testing market in 2017. The growth of the acoustic emission testing market for storage tanks can be attributed to the real-time monitoring solution provided by AET for detecting flaws in tanks without halting the operation and evacuating the product. In storage tanks, AET detects flaws or leakages at an early stage and thus helps in reducing the subsequent environmental damage. The acoustic emission testing market in APAC is expected to grow at the highest CAGR during the forecast period. The growth of the AET market in APAC can be attributed to infrastructural developments and manufacturing of defense aircraft. Improvements in terms of economic growth, infrastructural developments, and the construction of power plants boost the acoustic emission testing market in APAC. High system cost and lack of skilled workforce are inhibiting the growth of the AET market. The cost involved in AET includes the cost of hardware, software, and services, which depends mainly on the complexity of structures and construction cost. Highly complex structures require more instrumentation, which increases the overall cost. AET equipment requires a high level of technical know-how; it largely depends on a particular vertical and the type of flaws and errors being detected in the machinery. The key players in the acoustic emission testing market include TUV Rheinland (Germany), MISTRAS (US), TUV Nord (Germany), Parker Hannifin (US), TUV Austria (Austria), General Electric (GE, US), Acoustic Emission Consulting (AEC, US), Vallen Systeme (Germany), KRN Services (US), and Score Atlanta (US). These players have adopted strategies such as partnerships, acquisitions, agreements, expansions, contracts, product launches, and collaborations to achieve growth in the acoustic emission testing market.